Do you see babywearing only as a way to get your hands free again ? Carrying your little one does much more for both you and baby ! Sure, many parents think about the practicality of babywearing when shopping for their first carrier. Which parent has never had a grumpy baby in his arms and needed to grab something in the fridge, answer a phone call or attend to their 1st born ? Babywearing, no matter the type of carrier used, gives mobility and freedom back to the carrying adult. When I started babywearing, I wanted to make sure I would be able to keep my little one close to me. Carrying with your arms is wonderful and allows the same type of closeness between carrier and carried, but I couldn’t help worrying about arms, shoulders and back pain. Once I got into it, I realized that I could easily go out shopping, dining or socializing, while keeping my tiny human both close and secured. But I also came to understand that, because he was in the carrier so much, my little bundle of joy was greatly benefiting. Carried babies are less stressed and overall more confident as their basic needs are attended faster. When baby is on you, your response time to any of his need is shortened thanks to the proximity allowed by the carrier. Babies’ stomach are not fully closed until they can walk on their own? This is why your little one often spits up after a meal. Being in a carrier for the time of digestion (20 minutes for a breastfed baby and up to 2 hours for a formula fed baby) allows your child to digest peacefully and prevents regurgitation. Besides the obvious benefit of being able to use your hands again, babywearing can have multiple positive impacts on the carrying parent as well. Mums who carry their babies are more likely to succeed at breastfeeding and often the carrier used allows a more discrete installation of baby on the breast. It’s easier to go out with a tiny baby in a carrier. In a restaurant or sitting outside for coffee, your child is comforted by the closeness with your body while you do not have to worry about parking a bulky push chair by the table! It is way easier to take public transportation with a carrier than a push chair ! And where the weels can’t go (damaged sidewalks, stairs, nature sites…), the carrier often can. Household chores get done more easily when parents are able to put baby up in a carrier (laundry, dishwasher, vacuuming…there are many tasks you can accomplish with your little one up), hence reducing the overwhelming feeling of not getting anything done most parents feel when they welcome a wonderful new addition to the family ! 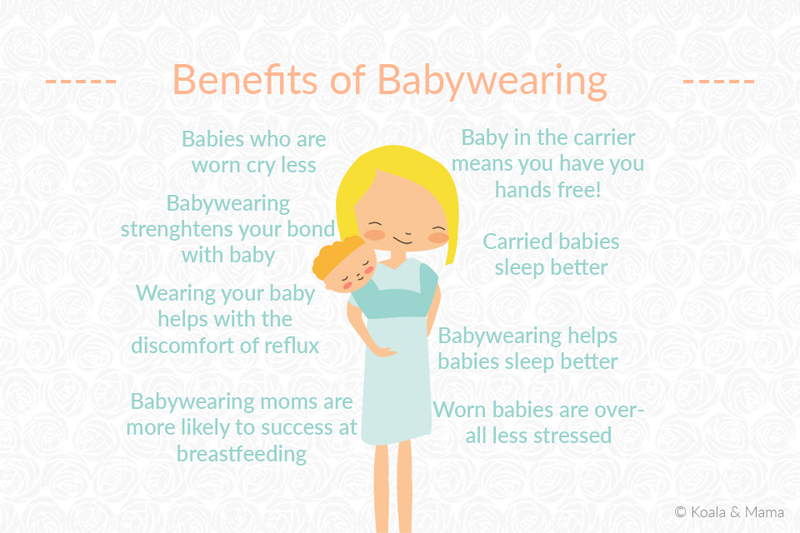 Babywearing helps babies to feel more secure, calm, and loved; parents bond and find the ability to go places and use their hands again, a win-win situation only made better by snuggling and shared love <3.